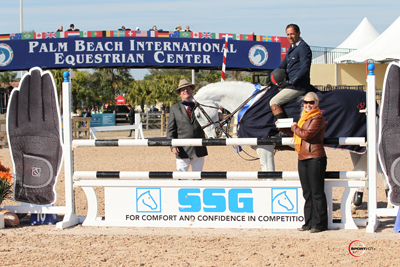 Yann Candele and Redefin won the first round of the $30,000 WEF Challenge Cup at the 2011 FTI Winter Equestrian Festival. Photos © Sportfot, Official Sport Photographer of the FTI Winter Equestrian Festival, www.sportfot.com. Wellington, FL – January 13, 2010 – The 2011 FTI Winter Equestrian Festival (WEF) held its second day of competition today with the first of 12 weekly WEF Challenge Cup grand prix classes. Canada’s Yann Candele and Redefin, owned by Susan Grange, were the fastest double clear combination to earn the top prize. Held at the Palm Beach International Equestrian Center in Wellington, FL, the 2011 WEF will hold 12 consecutive weeks of competition for its winter show circuit, running through April 3, 2011. Round 1 of the $30,000 WEF Challenge Cup was held in the International Arena over a track set by course designer Anthony D’Ambrosio of Red Hook, NY. Out of 26 original entries, seven made it to the jump-off in the Table IIa class. A distinguished list of horses and riders qualified for today’s jump-off in the WEF Challenge Cup and four were able to go double clear, each besting the leading time until the final competitor completed the fastest round. Rodrigo Pessoa (BRA) and HH Ashley, owned by Double H Farm, were the first pair to jump clear in a time of 40.060 seconds but were then pushed out of the lead by Margie Engle (USA) and Hidden Creek’s Pamina L with a time of 35.911 seconds. McLain Ward (USA) and Louisburg Farm’s Esplanade 7 completed the course in an even faster time of 35.589 seconds, but along came Yann Candele (CAN) and Redefin to shave another second off the clock to finish in a blazing fast 34.490 seconds. In the end, the top four riders finished in just that order respectively, with Candele and Redefin rising to the challenge to earn first place. Ward finished in second, Engle in third, and Pessoa in fourth. Kent Farrington (USA) and Vanhattan completed the fastest four-fault jump-off round in 35.588 seconds to finish in fifth place. In addition to earning the top prize for his efforts, Candele was also presented with a $3,000 bonus for riding in his SSG ‘Digital’ Gloves during today’s class. The SSG ‘Go Clean for the Green’ promotion will be offered weekly in the WEF Challenge Cup Series, the Amateur-Owner Jumper Low Classic, and the Amateur-Owner Jumper High Classic competitions. If the winning rider in any of these three competitions is wearing SSG ‘Digital’ Riding Gloves with the SSG horse head logo clearly visible on the wrist, they will be presented with a cash bonus during the awards presentation. The 2011 FTI Winter Equestrian Festival will continue tomorrow with the Spy Coast Farm 1.40m Speed Challenge, held at 1 p.m. in the International Arena. The highlight class of the week is Sunday’s $30,000 Speed Derby at 1 p.m.
For full results please visit www.shownet.biz and for more information, visit www.equestriansport.com. The 2011 FTI Winter Equestrian Festival has 12 weeks of top competition running from January 12 through April 3. 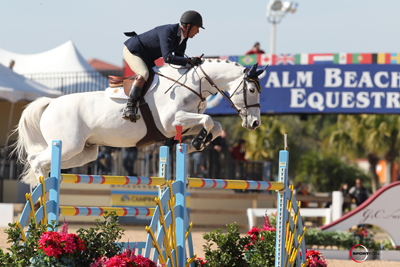 WEF is run by Equestrian Sport Productions, LLC, and Wellington Equestrian Partners and held at the Palm Beach International Equestrian Center. All 12 shows are “AA” rated and Jumper Rated 6, and more than $6 million in prize money will be awarded. WEF is proud to be supported by their title sponsor, FTI Consulting, Inc. FTI Consulting, Inc. is a global business advisory firm dedicated to helping organizations protect and enhance enterprise value in an increasingly complex legal, regulatory and economic environment. With more than 3,600 employees located in most major business centers in the world, they work closely with clients every day to anticipate, illuminate, and overcome complex business challenges in areas such as investigations, mergers and acquisitions, regulatory issues, reputation management and restructuring. For more information, please visit www.fticonsulting.com.